FSMA: The Simplified Guide. Download Now! 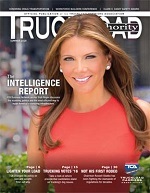 MISSED AN ISSUE OF THE TRUCKLOAD CARRIER REPORT? VISIT AND SEARCH THE ARCHIVE TODAY. Standard on VANTRAAX® ULTRAA-K™ slider systems and available on other select VANTRAAX models, ZMD® technology eliminates shock absorbers from the maintenance equation all together and integrates the damping function traditionally performed by the shock within the air spring itself. With a revolutionary combination of in-cab driver sensor and forward facing camera, Guardian detects fatigue and deters distraction. Our proven fleet safety technology helps prevent incidents before they happen and protects what matters most: your people, your reputation and your bottom line. Trial Guardian. Register for a risk assessment of your fleet. With a video-based safety program, you can get the information you need, when you need it for an objective picture of complex driving incidents. Improve driving performance by focusing on what drivers are doing well, what needs improvement and how to prioritize coaching efforts. Don't Wait for the Mandate!